New rising hotspots in Gwangju attract local residents and tourists from other regions. These are smaller than Chungjang-ro and streets around old City Hall, which are still popular gathering places for young people in the city, but have their own unique features. If you are sensitive to a trend, you may have already visited one of them. Many people like hot-places and will have a great time at them with delicious food, and take photos with a fabulous background. Where do you usually go with your friends to hang out? 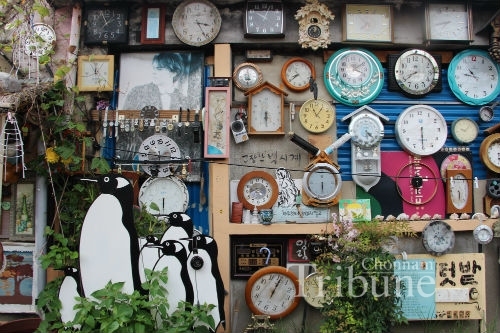 The Chonnam Tribune will recommend some hot-places with attractions such as art, ambience and youth creativity in the city so that you can feel the atmosphere of each spot. Hopefully you will discover the cultural value of the places in Gwangju. Penguin Village, named after the walking pose of aged residents’, is one of the visitor attractions in Yanglim-dong. It was an abandoned part of the village after some residents moved to new homes and left old clocks and other stuff. Old residents cleaned this area and made a vegetable garden. The village chief started to decorate their living place with abandoned stuff and this small village came to be the place for junk art. This transformation process is quite meaningful since residents made everything without arts training or education. When its fame spread around Gwangju, artists and craftsmen flooded to Yanglim-dong and chose that place as their working place. Jeong Kang-im, one of the artists who live in the area said, “In an independent working environment, I am internally motivated by many artists who were born in, who have lived in, and who are working in Yanglim-dong now.” For all ages, Yanglim-dong has been standing firmly as the herb for the spirit of art in Gwangju. 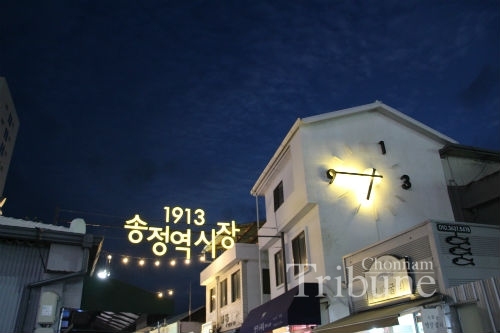 1913 Songjeong Station Market has become the newest tourist attraction as a hip traditional market with the creativity of the youth since this April. You will find the market retains the old things and brings in the new things as well. You can learn the history of the stores written on the boards hung in front of decades-old stores, while having fun drinking craft beer made by young sellers. “It feels much better to see a group of young people walking into the market,” said Lee Gui-mo, who has run a mill in the market for more than 60 years. Many visitors may feel that there is a lack of stores to differentiate customer experience, but this place has unique cultural characteristics. Many visitors may discover the historical and cultural value of the places by enjoying diverse activities and shopping experiences at those hotspots mentioned above. However, it can be a double-edged sword to become top attractions because those areas seem to experience gentrification, which leads tenants to leave their workplace in gentrifying areas due to rising rents. Daein Market is a typical example of gentrification in Gwangju. Ki Jae-hong, who is in charge of Daein Night Market said, “Building owners would not accept the low rent for artists, and that is why food sellers enter the location instead. It is pitiful that the market organizer does not have the authority to mediate between landowners and artists.” Fortunately, 1913 Songjeong Station Market would be the best example of the effort to keep the place from being gentrified. The building owners and newly arrived young sellers signed a ‘Memorandum of Understanding for Gentrification Prevention’ soon after the market opened in April 2016. The owners promised to keep the rent fee reasonable, and the young sellers assured to invigorate the business and make the market a pleasant place to visit. It is not sufficient to control the gentrification of hotspots, which have to retain their unique features and products for sustainability. The Chonnam Tribune asked Chonnam National University students about their opinions on hotspots in Gwangju. Respondents chose Chungjang-ro as the hottest spot because it is available for one-stop shopping and entertainment. Streets nearby the old City Hall and Sangmu District are the places for drinking culture were runners up. Meanwhile, a number of respondents answered that these places do not have any differentiation with hotspots in other cities. 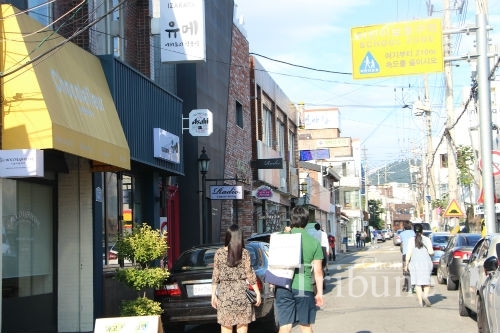 Regarding this matter, Lee Mu-yong, a professor of the Graduate School of Culture at CNU advised, “Anything FOBU – First, Only, Best, and Unique – in Gwangju needs to be discovered.” He also added a comment in reference to Dongmyeong-dong. “The number of visitors will increase if ‘hot’ people are there. People are the key point of making a place a hotspot.” Furthermore, we have to be mindful of Gwangju’s potential and to find creative ways to sustain attractive places in our city. It will transfigure into a city that has a variety of must-see places with their own uniqueness and attractions when we endeavor to take a step forward into the city of art and culture.